In this short, clear, and to the point walkthrough, I will show you how to get the Orange Beret in Unturned, also called the Experienced Beret. What is the Orange Beret? 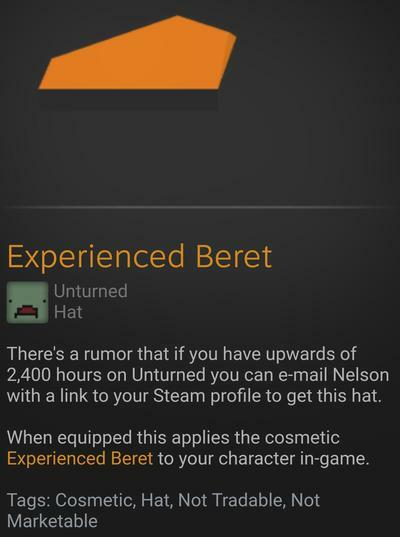 The Orange Beret, which is also called the Experienced Beret is a non-purchaseable, non-marketable steam item that is awarded to any users who have emailed proof to Nelson of their obtaining of 2,400 ingame hours (100 days) in Unturned. The Experienced Beret is one of the rarest items in the game, with very few copies being given out to users. The most common reasons are that people don't know that they can get it, or do not make it to the 2,400 hours count before abandoning Unturned. Actually getting the beret to your inventory is the easy part. 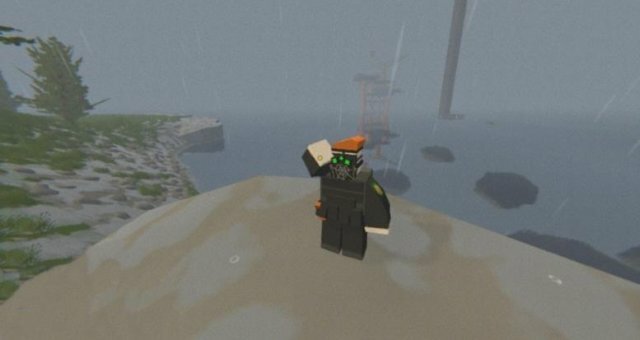 The hard part is obtaining 2400 hours in Unturned without wanting to quit. The fact that you're reading this proves to me that you're dedicated enough to get it and work towards the beret. Just send both the image of the hours and your link and request for the Experienced Beret and you should get a reply within a week at most. Make sure that your inventory is set to public as he needs to verify that you actually did get the hours and be patient! It's a free item and the last thing Nelson wants is someone complaining about it in his emails.